Compare and analyse planned, published and actual crew utilization. 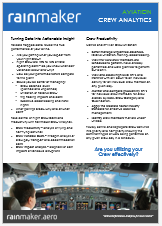 Monitor and compare utilization of crew versus targets and KPI’s. The Crew Day Statistics Analytics Module analyses crew schedules to determine a single crew-day count for the predominant activity performed.